31 weeks with Auntie Carole barking at Baby L.
This week, I suffered from a nasty cold and cough. Being preggers and sick is awful. At week 31, I know I should be thankful this was my first encounter with it, but still, I’m already uncomfortable and really unable to bend over. Add a deep cough that hurt my baby belly and an apprehension to have medicine, and it ain’t easy! I called the doctor on Monday and was instructed to take Tylenol Cold and cough medicine. Life savers! The cough was terrible at night and most every night this week, I ended up on the couch so I wouldn’t disturb Chad and could sleep in a more upright position to prevent the coughing. To top it off, I officially started at the new contract. I hate when people come to work sick, but here I was … that girl … because how do you call in sick your first week on the job when you have approximately 40 days to support them in the first place?! Cough drops and water helped suppress the cough, but I know I was making others uncomfortable with my hack. Workouts were nonexistent because I didn’t want to perpetuate my cough and I didn’t have it in me to do much of anything, including walking pooch. Luckily by the end of the week, the cold was gone! In other news, Baby L continues to move all over. We can now watch movement from the outside – it’s so wild to see and always leaves me laughing. Baby has most recently given me the joy of sticking something against my rib cage making breathing and coughing all the more exciting! This week in baby preparations, we attended a pediatrician meet and greet. It’s a group practice not far from us. While we weren’t thrilled with the office aesthetics or the fact they don’t do hospital visits at the time of birth, we loved the founding doctors. One and done! As most who CrossFit know, The Open launched this week.The Open is the first phase of three competitions that determine the fittest man and woman on earth. The Open is just that – open to any competitor worldwide to compete in WODs on the worldwide stage. 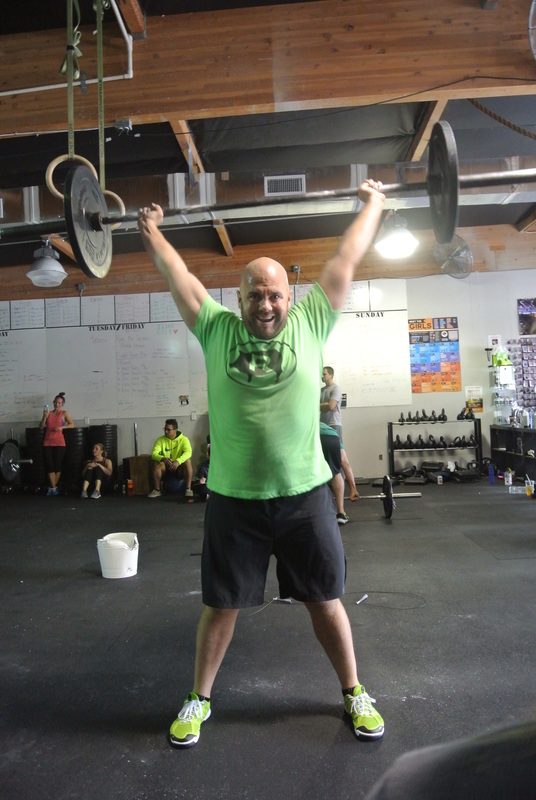 WODs are announced every Thursday and athletes have until Monday to post a score. 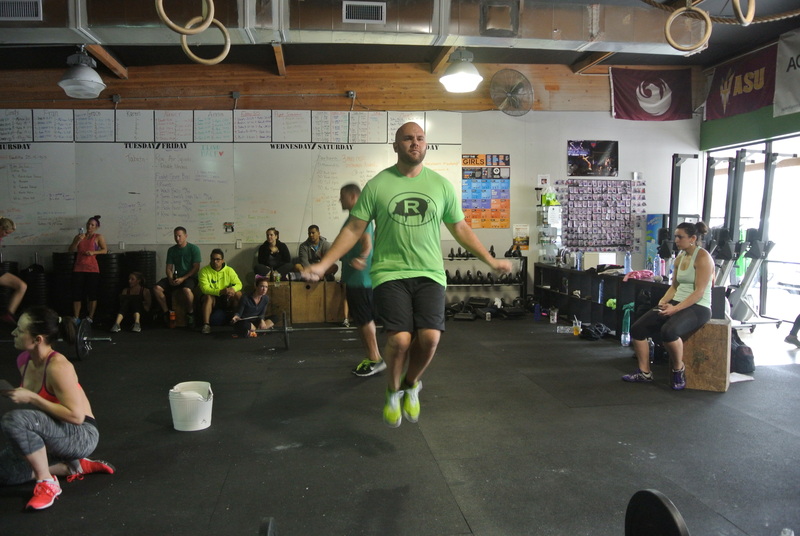 It’s a five week competition and in the end, the top athletes compete in Regional events (part two), which leads to the final competition series: The CrossFit Games. So, while I won’t be competing, I will be in the box weekly cheering on the hubs and my CrossFit family. Don’t drink the water in the Back Alley! 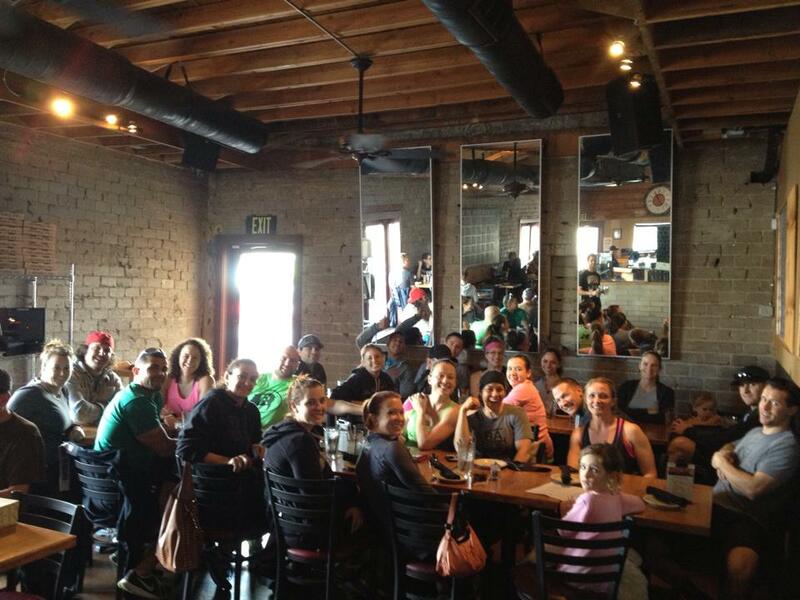 Lunch with the crew post 14.1. Photo credit: Risa Kostis. I’ve received a number of questions about being paleo. There are a ton of bloggers and resources readily available with a quick Google search. That’s how I started my journey. I started eating a paleo lifestyle not long after I began CrossFitting. I was working out multiple times a day, constantly starving, and not seeing any results. While I had previously thought, “I’ll just workout harder to circumvent the pleasures of eating whatever I want,” I quickly realized I wanted to see results more than I wanted to eat just anything. Couple that with a childhood intolerance to lactose and a realization that grain causes me to bloat and there was no question what I should do. All that Googling led me to sign up for the Paleo Meal Plan. I felt like the $9.99 per month was worth the guidance. With that monthly fee, I received weekly meal plans and a shopping list. Each email came with tips and blog posts, too. The recipes for the meal plan are all free and available on the the site. This took the guesswork out for me; I knew I was eating balanced meals (my biggest concern) and I wasn’t required to do any planning. This plan also taught me how to make enough food at dinner to have leftovers for lunch. My biggest challenge (and remaining challenge) is making breakfast differently. You can only have eggs so many times a week. When I have time and can prep in advance, I’ll make some paleo breakfast bread or try some of the other recipes, but typically the mornings are rushed and I end up frying an egg with bacon or some other breakfast protein. I kept up the plan for about six months. Since then, I’ve subscribed on and off three or four times. I find it that useful. And I’m always on the site pulling recipes. Our CrossFit affiliate used the Paleo Meal Plan last summer to structure the paleo challenge, too. While Googling will lead you to a lot of various sites and “diet” plans, I feel like Neely and her team offer a realistic, easy approach. P.S. – paleo is not a diet; it’s a lifestyle. More on that in a bit. While strict paleo calls for the truest of foods (organic, grassfed, yada yada), our grocery budget doesn’t lend itself to that every week. I get most of our meat from Costco. Because we cook so much, buying in bulk saves us in the long run. Costco also carries almond butter, almond milk, coconut oil, coconut milk, a broad selection of nuts, honey, and frozen berries. Again, while probably not the BEST (i.e. Whole Paycheck, I mean Foods quality), it allows us to buy large quantities of what we consume the most. For some of the other basic shopping list items, I grew up going to Henry’s/Sprouts every time we visited family in San Diego. Since moving West, I’ve used Sprouts as my place to get specialty meats and bulk items, like almond meal, flax seed, and coconut flour. It’s the best price and I can get the actual amount we need. For those outside this region, I recommend finding bulk options, especially for the almond meal and coconut flour. I don’t do a ton of baking (and I’ve bombed a lot of paleo baking recipes), but it’s good to have on hand when a recipe calls for these items. I’ve slowly acquired a few paleo cookbooks, but a lot of my recipes come from Google. If I want to try baking something, I Google “paleo banana bread” and read recipes for simplicity of steps and ingredients. I do love my Paleo Comfort Foods cookbook. It’s added some great recipes into our circulation. I also recently got a Paleo Slow Cooker cookbook. The crockpot is my best friend during busy weeks! Diet vs. lifestyle. I say it’s not a diet because it’s not. Once I learned the basic principles and experienced how I felt, I knew it was how I wanted to look, feel and live forever. Pregnancy has screwed that up; and screwed with my mind for awhile, but I went with my cravings, knowing I would be back full-force quickly. And typically our meals during this pregnancy don’t stray too far from our typical paleo planning and preparation; it’s more of the snacks and sides I’ve included in meals, which Chad doesn’t eat. Outside of pregnancy, we do “cheat.” We love cheese. Chad loves circulating Greek yogurt into the mix for dessert every now and then. We still drink booze (not me while pregnant, obviously). We have coffee (I use coconut milk as a cream substitute; Chad uses almond milk). We love Mexican food, froyo, cheeseburgers. And when we’re on vacation, we do the best we can, but don’t limit ourselves from an experience. But we also work hard to find alternatives. When we’re out to eat, I’ll order a burger on lettuce instead of a bun (but I’ll keep the cheese). We’ll order sweet potato fries instead of french fries. The restaurants that do sustainable cooking are obvious choices, but we also have go-to’s that we know we can have an enjoyable meal while honoring our bodies. It takes work and practice, but once we understood those principles, it got easier. There’s also a primal paleo movement. Mark’s Daily Apple, one of the best paleo or primal resources, gives a good breakdown. It’s interesting to note CrossFit HQ promotes the Zone Diet and even includes an overview of it in the Level 1 seminars. Many of the top CrossFitters work out so much that they need grain/carbs and calories to sustain. While CrossFit led me to paleo, by no means is it what all CrossFitters do. If you have questions, feel free to post! 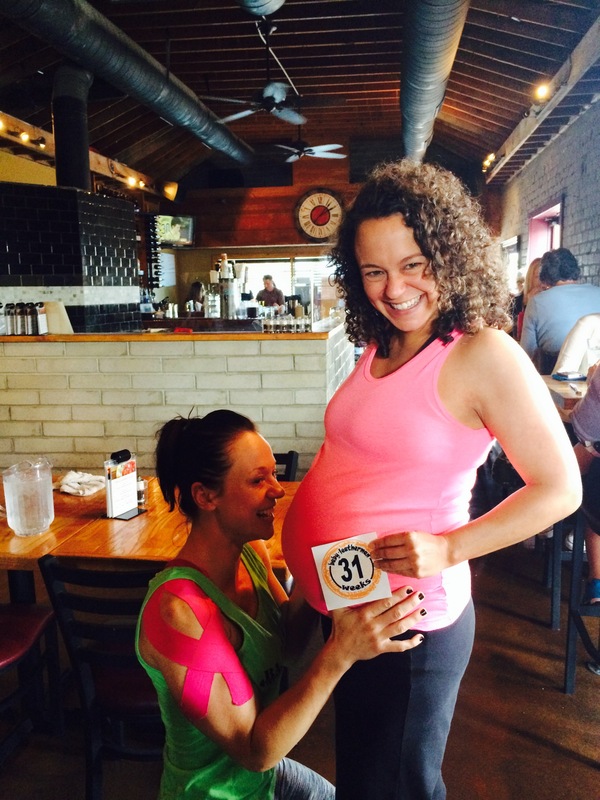 Posted on March 2, 2014 by crossfitpregs. 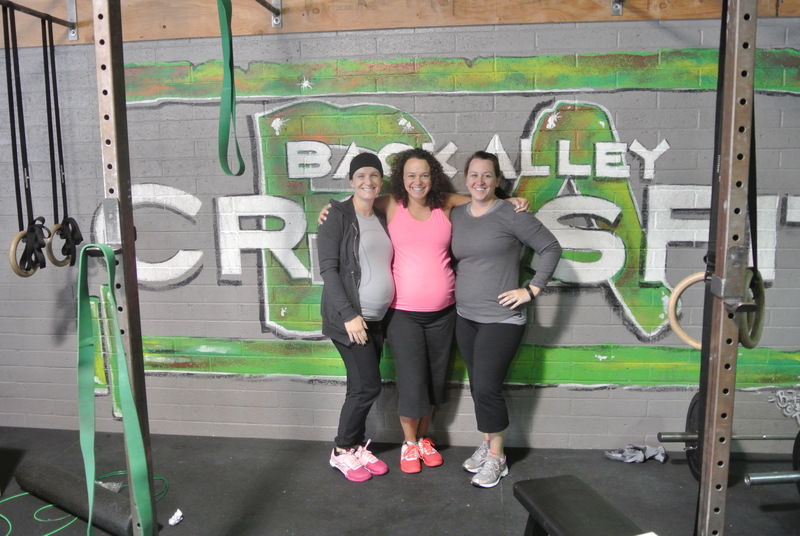 This entry was posted in CrossFit and tagged 14.1, CrossFit, CrossFitting, Fit Pregnancy, paleo, pregnant, sick and pregnant, The CrossFit Open, WOD. Bookmark the permalink.